First I need to establish the typical parking stall width. Using the DISTANCE command, I learn this value is 8′ 10-1/4″ (106.25 inches). We need something to link the Field we’ll create in a moment. 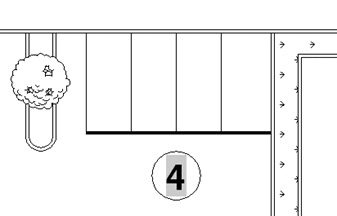 I’ll draw a simple Line spanning the entire run of parking stalls to serve this function. With this line in place I’ll insert my standard parking count block. It’s worth noting that its also possible to use Multiline Text , however I find Block Attributes to be the better choice since they are compatible with Data Extraction tables (that could be used to calculate a site total). Within the Edit Attributes dialog, right-click inside the textbox for your parking count attribute, and choose Insert Field. 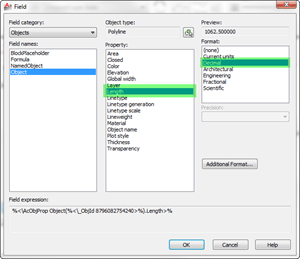 From the Field dialog, change Field Category to Objects; select Object from the Field Names list; and finally click the Select Object button next to the Object Type textbox. 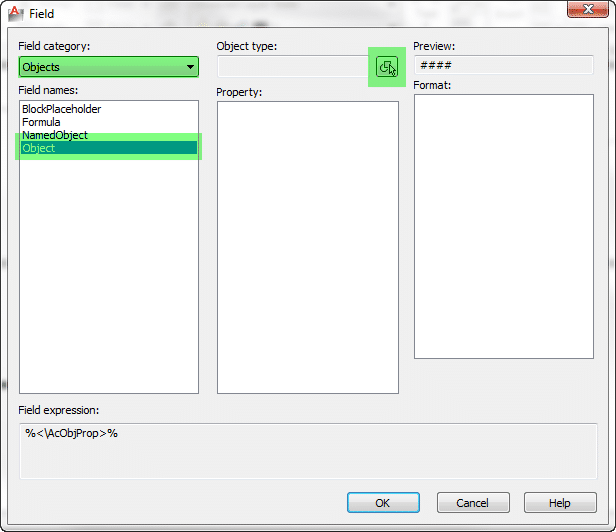 At the Select Object: prompt, select the parking run reference line created in step 2. 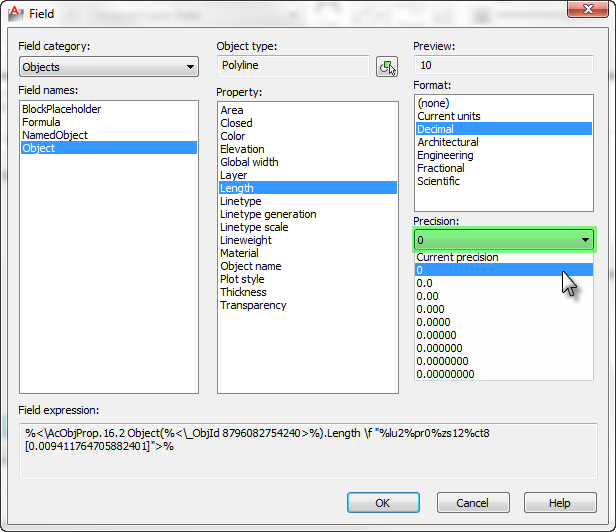 Once returning to the Field Dialog, select Length as the Property, and Decimal as the Format. 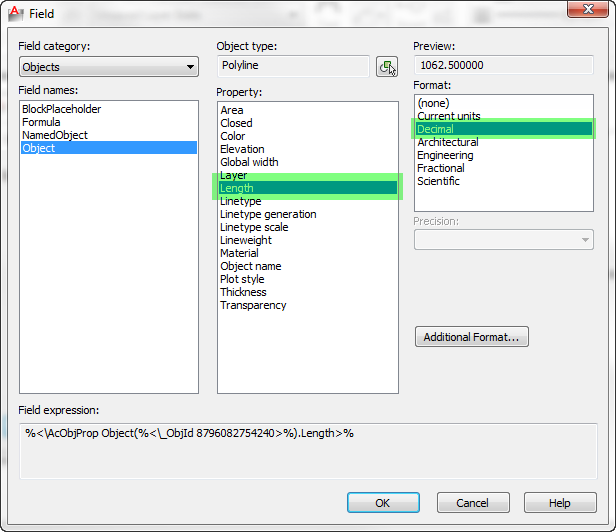 Open the Additional Format dialog by clicking the Additional Format… button in the right column of the Field dialog. Calculate the Conversion Factor by dividing 1/106.25. 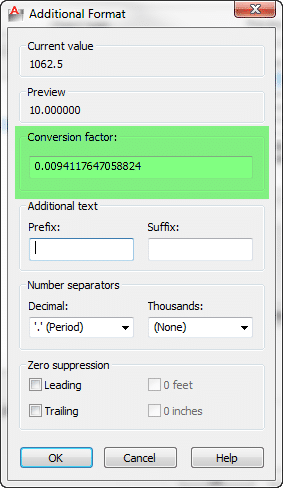 Enter the result into the Conversion Factor text box. To ensure an even number like 10 instead of 10.00, check the Leading and Trailing checkboxes for Zero Suppression. Click OK. The Parking Count block is placed into your drawing, reporting the correct count of parking stalls. With the first run complete, additional runs are easy to calculate. 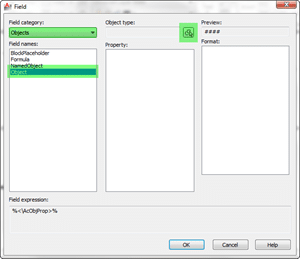 Using the COPY command to copy both the block (field) and reference line will automatically associate the new block (field) with the new reference line. 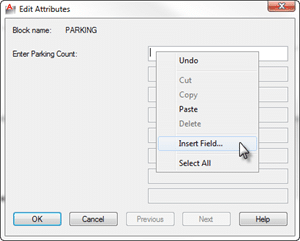 Start the COPY command and select both the Reference Line and the Parking Count block (field). 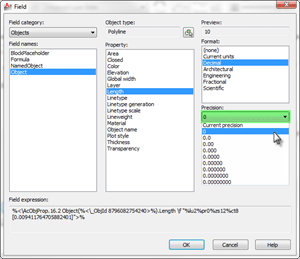 AutoCAD will not create a new link unless both the reference line and Parking Count block (field) are selected at the same time. After creating a copy of the original Field/Reference Line combination, use Grips to adjust the new Reference Line. Thanks for the great tip! I’ll definitely be using this. I personally use the DIM command for this and turn off arrows and dimension lines by creating a Parking Count DIM style. How do you get the dim to display the number of spaces rather that the diminsion size?